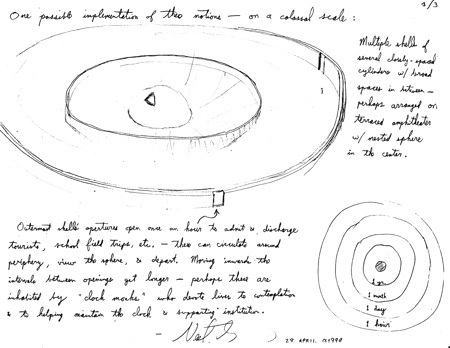 In 1998 Danny Hillis asked some friends to make sketches of what they imagined a 10,000-year clock should look like. Science fiction author Neal Stephenson, among others, provided several sketches. One of them outlines a clock contained in concentric circles of walls, which opens to outsiders at specific preordained intervals. Multiple shells of several closely-spaced cylinders w/ broad spaces between — perhaps arranged on terraced amphitheater w/ nest sphere in the center. Outermost shell’s apertures open once an hour to admit & discharge tourists, school field trips, etc. — these can circulate around periphery, view the sphere, & depart. Moving inwards the intervals between openings get longer — perhaps these are inhabited by “clock monk” who devote lives to contemplation & to help maintain the clock & supporting institution. 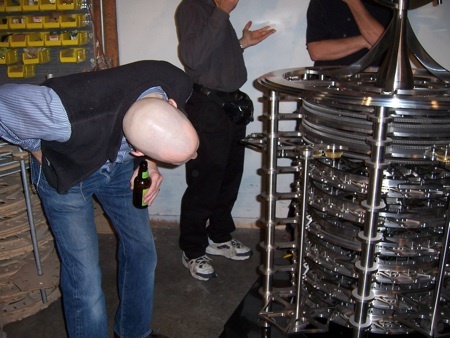 In the ten years since then, Hillis and crew have developed engineering designs for the Long Now 10,000-year Clock. Currently the plan is to build the Clock inside a mountain at the end of a long vertical tunnel entrance. Some details of Neal’s ideas may yet be implimented, but the vast circular compound of gates and inner walls won’t be part of the initial Clock. However, this wonderful Clock idea lives on and is rendered in much greater detail in Neal’s new novel “Anathem”. Like other Stephenson novels, the book is long and epic. The story is complicated and even confusing at first. The plot explores the friction between the scientific (“mathic”) monks inside the sanctuary of the Clock and the “saecular” superstitious folks living outside the walls in the “extramuros.” The clockers have a different sense of time and responsibility, trying to safegaurd civilization’s knowledge. But the two worlds come clashing together in cataclismic event. At Long Now Foundation we’ve always resisted the idea of turning the institution into a religion — even though religions may have the best track record for long-term endurance. 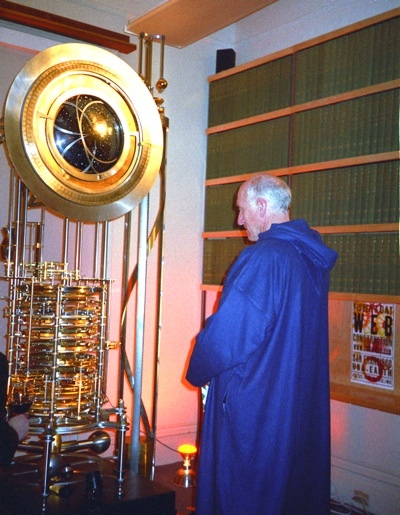 But the comparison to monks devoting their lives to maintain a remote and long-lived clock is hard to avoid, especially if you show up at a momentous clock event in a hooded robe. Work on a prototype 10,000-year clock was completed in time for the millennial celebrations in 2000 (or 02000 as Long Now likes to write it). We installed the clock temporarily in Building 116 in the Presidio, San Francisco, where the Long Now offices were. Long Now was subletting office space from the Internet Archive, where the entire internet was backed up. So in a wonderful parallel to Neal’s later story, the clock was resting in a room only a dozen feet away from the modern universal library of our time. 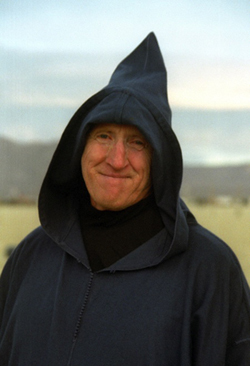 Stewart Brand, co-founder of the Long Now Foundation, had just returned from a vacation in Morocco the day before so he was wearing a djellaba. I took this snapshot of Stewart contemplating the completed Clock just a few minutes before midnight on the New Year’s Eve of Y2K. The Clock had just been finished in the last few days. The attractive idea is that the clock would bong once for a new century, and bong twice for a new millennia. We were gathered around the prototype clock when it was due to strike twice — once for the century, and once for the Y2K millennium. It was a very strange scene. Because of hysteria about Y2K, the Presidio was blockaded with a police checkpoint. No one else was around the usually busy park. It was a like a secret society meeting. A very few people, maybe a dozen in total, gathered at the clock as it struck the new year/century/millennia. Stewart looked like a monk overseeing the clock’s big moment. At the countdown there was a total hush because we had no idea if the chimes would really work. Then at midnight, the gears started clicking, whirring. One gong! Silence. Then another gong! Then a collective sigh because we realized it would not happen again for another 1,000 years. 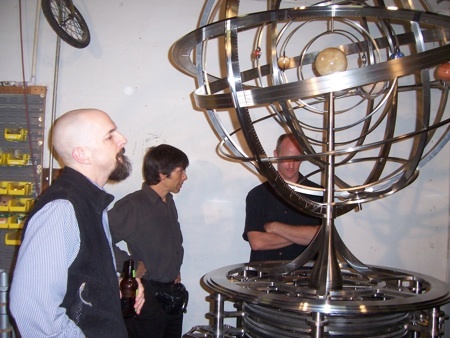 Neal was not present (and had never seen this photo), but when a second version of the Clock’s orrery was unveiled in the Marin county machine shop where it was assembled, Neal traveled from Seattle to inspect it. I took a few quick snapshots of the encounter. Neal is a tinkerer. His dad was an engineer. He writes for a half a day and then works in a shop for the other half. He tinkered with hardware experiments for Jeff Bezos’ Blue Origin rocket project, and now he is working at a lab for Nathan Myhrvold’s patent factory. He here is at Chris Rand’s machine shop, where the parts for the Clock were assembled. 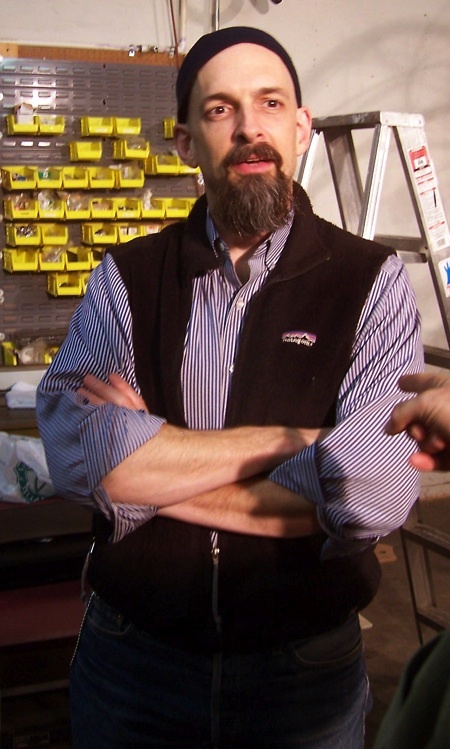 A fuller profile of Neal Stephenson by Steven Levy appears in the September 2008 of Wired. Neal’s book Anathem will launch in San Francisco on Tuesday, September 9th at the Regency building on Van Ness. Because of the overlap in interests, the debut party will be co-hosted by Long Now. Neal will read from his book about the Arbre Clock, Danny and Stewart will talk about the Long Now Clock, there’ll be a martial art demo (an art based on the story), and there will be a performance of unique music. The Anathem has also spawned a CD of music recorded in the same manner of the music described in Neal’s book. This is mathic music, mathematically generated chants, created especially for Anathem by composer David Stutz. The designs for the chimes of the Long Now Clock are also mathic generative; a prototype of the chime generator is on view in the Long Now museum in Fort Mason. For another example of “mathic” music for a long clock, see Brian Eno’s CD of computational Long Now chimes (titled January 07003). David Stutz’s CD will be available at the event. Tickets for this celebration of long-term thinking — and launch party for a highly anticipated science fiction novel– are available here. They cost $11 for admission, and $45 for admission plus signed book. If you are a Long Now member, your ticket alone is free (but you have to RSVP. To become a member, join). You can hear Neal read a bit of the beginning of his book on this Amazon video clip. He’s a better conversationalist than reader. It should be quite an evening. We’ll be filming the event as we do all Long Now Seminar talks; the video will be streamed LIVE by Fora.tv that evening at 7pm PST.